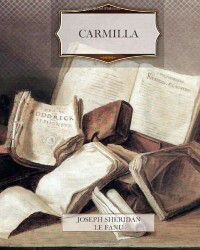 Published in 1872, Carmilla was one of the first vampire books written, preceding Dracula by a good twenty-five years. 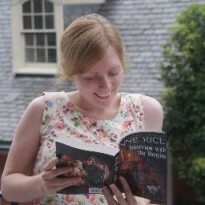 It's about Laura, who lives in a gothic castle in Styria, Austria with her father. One day they witness a carriage accident near their home and offer to shelter a young woman whilst she recovers. Laura's loneliness is answered by Carmilla's friendship and the two become close, although this coincidences with a rapid decline in Laura's health....I loved this little book. At only 95 pages, it can be read in one sitting but somehow still manages to contain all of my favourite elements of both gothic and vampire/horror fiction. There's the wonderful setting of the dark woods and deserted castle, the leisurely writing pace, the creepy sense of foreboding but above all, the atmosphere. From the moment I picked this book up and started to read I felt as though I had been transported into the author's imagination and could practically see the mist rising over the moon and hear the tree branches creaking ominously.Of course, Carmilla isn't really scary to modern readers. When you read it, you have to bear in mind that readers at the time of publication weren't familiar with the vampire myth. So blindingly obvious 'VAMPIRE - RUN AWAY!' clues go undetected by Laura (pale skin? sharp teeth?..what could it possibly mean??) and the horror is largely only hinted it. It's like an old fashioned horror film where things are suggested rather than just gore being shown. It might send a little shiver down your spine, but all the real fun is in the gothic writing style and atmosphere.Dracula is one of my favourite books and reading Carmilla, it's easy to see that Stoker was massively influenced by it. The setting is practically identical, and both books contain a vampire hunter (Baron Vordenburg and Van Helsing) and an innocent female victim. Normally it would bother me to think that a book I like so much isn't completely original, but as I like both books equally, I will instead just put Carmilla where it belongs next to Dracula on my shelf.